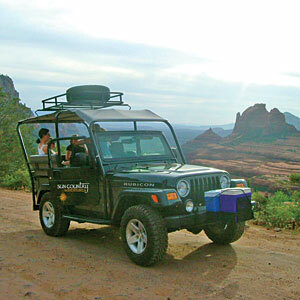 There is so much to do in and around Sedona for the entire family. Guests of El Portal Sedona Hotel have access to unique and personal concierge services for Sedona and area. We can arrange trips to the Grand Canyon, complete with picnic lunch. We can drop you off and pick you up at some of the best trail heads in the country. We can give directions and maps to the top tourist spots – Sunset Volcano Crater, Indian Ruins, Montezuma Well and Castle, Meteor Crater, as well as custom guided adventures. There’s swimming at Slide Rock State Park, a natural water hole and slide right in the Oak Creek Canyon! There are biking paths for the beginner to extreme adventurer- we can arrange bike rentals for your whole family! El Portal is just a short 2 minute walk to Tlaquepaque Arts and Crafts Village with eclectic shopping, galleries, delicious dining, and a great candy store. We can book hot air balloon rides. These exciting expeditions let you soar through the blues skies gliding over the incredible beauty of the red rocks and the tall pines of Coconino National Forest. The luxury inn is a wonderful place for your family this summer, it is a pet friendly bed and breakfast located in the heart of Sedona. Check out the great Sedona hotel special – stay 3 nights for $699, and receive $140 in Sun Country Adventures Jeep Tours, $50 in food credit, and children and pets stay free! For your Sedona Arizona vacation call 1-800-313-0017, or book online and say “3 Day Summer Special” in the comments line. 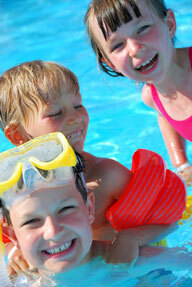 Our guests have access to 2 swimming pools, a full gym and Sedona Spa, right next door! Hurry, this Sedona vacation package won’t last forever! 1~800~313~0017!